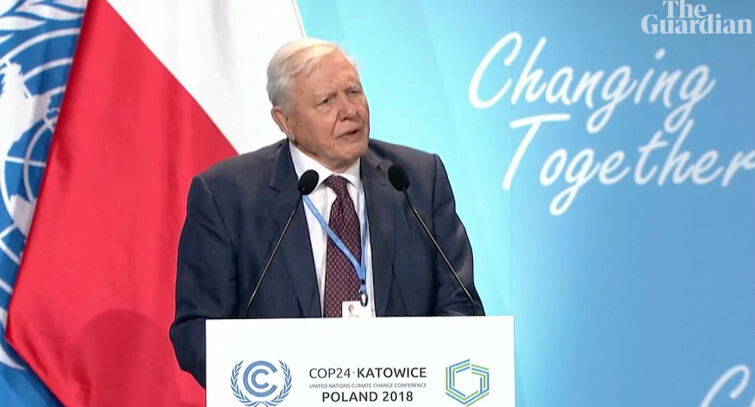 During the UN climate summit in Poland, Sir David Attenborough held a gripping speech about climate change. "If we don't take action the collapse of our civilizations and the extinction of much of the natural world is on the horizon," he said. We all know the 92-year-old David Attenborough from his soothing voice which took us on journeys through various landscapes in documentaries such as Life, Blue Planet and Planet Earth. The British naturalist was chosen to represent the world’s people at the summit in Poland. "Right now we are facing a manmade disaster of global scale, our greatest threat in thousands of years: climate change," he said. "If we don’t take action, the collapse of our civilizations and the extinction of much of the natural world is on the horizon." "The world’s people have spoken. Time is running out. They want you, the decision-makers, to act now. Leaders of the world, you must lead. The continuation of civilizations and the natural world upon which we depend is in your hands."